In the Premier League is the 26th matchday and the capital of the United Kingdom is looking forward once again to a London derby. No, this time it’s not about Chelsea, Arsenal or Tottenham. The focus is on Crystal Palace and West Ham United, who are dueling on Saturday in Selhurst Park. As in the last few years, it is for the two traditional clubs primarily to the league. While the Hammers in particular were able to get a decent cushion here, the Eagles still have to grow. The lead on the first relegation place is currently only four points, which is due in particular to the miserable performances in front of his own fans. Finally, the team of head coach Roy Hodgson is currently one of the three worst home teams in the Premier League. 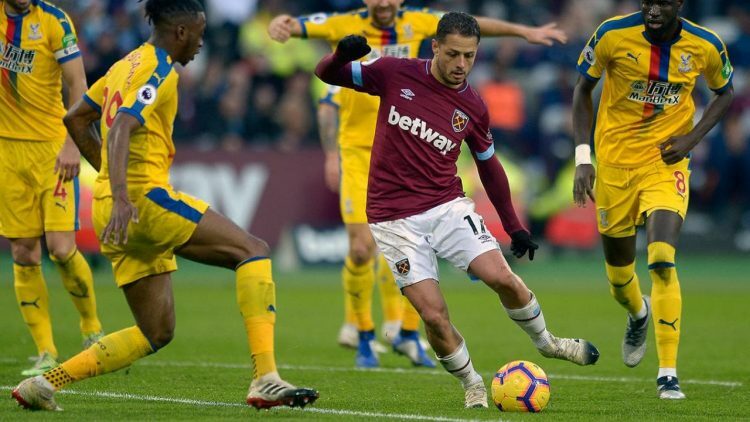 Regardless, they find themselves on Saturday again in the role of favorites, which may be due, inter alia, that the Hammers have lost the last three away games in series and are pursued by the injury pitch. Nevertheless, the Pellegrini-Elf put on Monday a cue against Liverpool FC, after all, a 1-1 draw could be wrested. Although the direct comparison of the two teams in Selhurst Park with three wins and a draw from the last four games clearly goes to the guests, we recommend for the encounter Crystal Palace. West Ham made a combined bet on the Double Chance bet 1 / X and over 1.5 goals by the hosts. The Crystal Palace Football Club plays since the 2013/14 season throughout the highest English league and was here regularly in the midfield of the table again. The last season finished the supervised by Roy Hodgson Elf on the 14th place, which she also currently occupied. The record of seven wins, five draws and a total of 13 defeats is anything but intoxicating. The reasons are certainly also in the weak offensive, which belongs to their 26 goals to the worse of the Premier League. In order to remedy this situation, Michy Batshuayi, a fierce attacker, was piloted in south London during the winter break. This is to support Max Meyer and Wilfried Zaha on the offensive and at the same time exert pressure on summer newcomer Jordan Ayew, which has so far lagged far behind expectations. In contrast to the offensive makes the defensive a decent job and so far ‘only’ 33 goals conceded, which corresponds to the second best value of the lower half of the table. The biggest problems Crystal Palace has so far in their native Selhurst Park, where so far only three wins from twelve games could be retracted. This went as far as nothing at the end of November last year. Only from December was a noticeable increase in performance to recognize. At least five out of eight home matches were won, most recently in the FA Cup against Tottenham Hotspur (2: 0) and in the Premier League against Fulham FC (2: 0). Striking here were the strong defensive achievements, because after all, stood in the end in six cases, the zero. Given the Eagles’ strong defensive performance and the recent closure of the Hammers, the London derby between Crystal Palace and West Ham is a tipping point, leaving the Hammers without a goal of their own, quite an exciting alternative. Corresponding bets are offered at odds up to 2.10. The West Ham United Football Club has been consistently represented in the Premier League for the last ten years with a one-year exception. The last season ended the Hammers in 13th place. The achievements in the current season are similar to those of the last. Currently, the team of chief coach Manuel Pellegrini is ranked nine victories, five draws and eleven defeats, a negative goal difference of -7 and 32 points in 12th place. Although the Hammers have nothing to do with the international business, the cushion on the first relegation place with ten points is already quite comfortable. Nevertheless, Pellegrini has problems especially on the defensive, after all, this is probably due to the rather thin staffing, with a total of 38 goals against the worse of the highest English league. The offensive, however, is at most a league average and hopes for the return of their top scorer Marko Arnautovic. After a false start at the beginning of the season, West Ham got relatively good momentum in comparison to the upcoming opponents and was able to take them until the middle of January. But then three distinct competitive games followed in a row, before this negative trend could be stopped last Monday in a duel with current leaders Liverpool FC. In the end, it was enough only to a 1-1 draw, with the interim lead of the overall clearly superior Reds fell out of an offside position. After the Pellegrini-Elf had to play a total of four competitive matches defeats abroad in a row and conceded at least two goals, three times did not mark their own goal and the point win and the goal against Liverpool last Monday is possibly classified in the category defensive battle is for the encounter Crystal Palace vs. West Ham’s predition on a safe bet on the home win imaginable. The betting odds for corresponding draw-no bet bets are still just in the interesting area with 1.48. So far, both teams have faced each other in 21 games. With nine victories, West Ham has been able to gain a small advantage, as Crystal Palace has only been able to win six victories so far. Here is the last success of the Eagles already four years back. As a result, the hammer has a total of four successes; another four times the points were shared. This positive balance of West Ham can also be transferred to the recent away games, of which the Hammers could win three in series before in the last duel in Selhurst Park a 2-2 draw out jumped. Just four weeks ago, we had a relatively clear forecast for the match between Crystal Palace and West Ham. However, due to the recent results and the injury severity of Hammers, we refrain from a corresponding recommendation. After all, Roy Hodgson can almost exploit everything, while Manuel Pellegrini has to cope with six losses and in addition to fear for a use of Nasri and Arnautovic. The thin staffing is likely to have been a major factor in the recent lows, because otherwise three bankruptcies and a lean draw from the last four games can hardly be described. Crystal Palace lost only three of the last ten home games (home record: 5-2-3). West Ham lost the last four away games in series (away balance: 3-2-5). The direct comparison in Selhurst Park goes clearly to the Hammers (balance 3-1-1). Accordingly, the bookmakers also favor the hosts and call for bets on the home win between Crystal Palace and West Ham odds to 2.10. Anyone who wants to bet on the score, should take a closer look at the Double Chance X / 2, which turns out to be quite interesting with betting odds up to 1.83. However, due to the current situation, we recommend a combined bet on the Double Chance betting 1 / X and over 1.5 goals of the hosts for the match between Crystal Palace vs West Ham. After all, the guests have been out of their own four outings and scored at least two goals each. By the way, the last direct comparison between the Eagles and the Hammers ended with a 2-2 draw. In the direct duel Crystal Palace vs West Ham, the odds for our recommendation are 2.20.